A potentially mega corruption scandal worth more than Shs158b threatens to shatter the country’s record of stealing public resources in a single scheme involving a web of government officials, lawyers and other private citizens. The network is suspected to have carefully hatched and fuelled the ripping-off of public money from the “land fund” with impunity for at least 15 years. It is a story that begins with the failure by government officials to establish proper procedures to run the Land Fund and ends with the same officials working with a carefully selected team with access to power to dig their fingers deeper into the government purse. The tale of mega theft also involves the same team, using insider information, manipulating would-be or intended beneficiaries with paltry pay-offs and or forged documents. To date, the Land Fund established under Section 41 of the Land Act as a “multi-purpose resource envelope meant to serve targeted beneficiaries, including tenants seeking to buy or own land, government seeking to buy land for redistribution to bonafide occupants or resettlement of the landless, among others” has never been operationalised but some government officials working with the “network” are using funds for the “support Uganda Land Commission” project to enrich themselves through shady reimbursements. 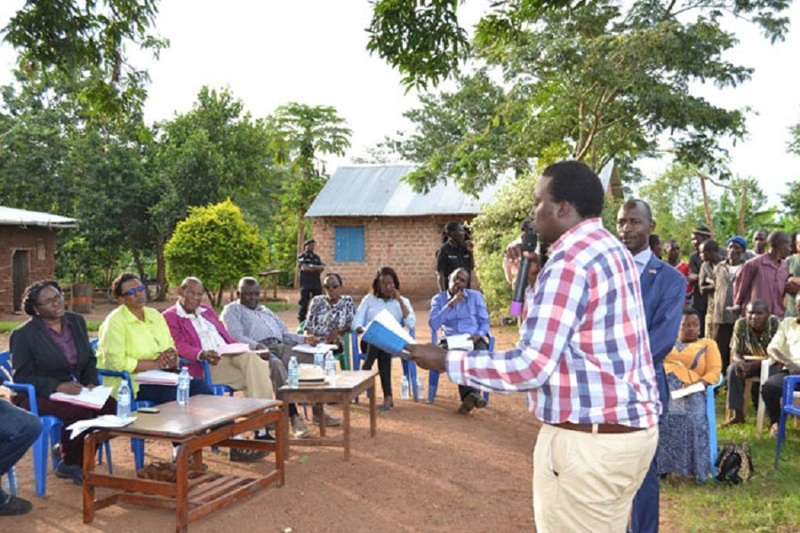 Through this and other avenues, taxpayer money has been channeled out ostensibly as compensation to absentee landlords in former lost counties of Buyaga and Bugangaizi in present day Kibaale District in Bunyoro. 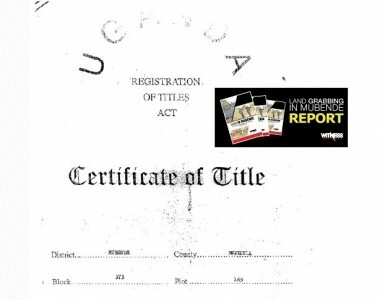 In 2002, government set up a land fund, among other things, to buy off the absentee landlords who hold land titles in Kibaale and other parts of the country. In other cases payments have been made and are still being made in names of people who are already dead. The scandal has also put the role of some judicial officers in facilitating the theft of public resources in the spotlight. For instance, some officers at Hoima Chief Magistrates’ Court issued letters of administration for property valued in billions of shillings yet the court has no jurisdiction to handle transactions worth Shs100m and above. Sources privy to the dirt that is believed to have been kicked off in 2002 say the Commission of Inquiry into Land matters led by Justice Catherine Bamugemereire has only scratched the surface of the “land fund cash bonaza”. But the commission is still probing deeper with more people expected to be summoned as revelations of their greasy hands come to the fore. “People who own the land didn’t get the money but it went to underserving people. At least 90 per cent of those who got the money are either middlemen or smart conmen in town,” a senior member of the commission told this newspaper in reference to what they have so far unearthed. The official declined to be named and instead asked Saturday Monitor to quote their statements during the commission’s proceedings. By the end of the ongoing investigations, the “land fund scandal” will share the same infamous podium with the 2012 Pension’s scandal in which taxpayers lost at least Sh169b and another at the Office of the Prime Minister where at least Shs50b was lost. Similar corruption scandals that have raised eyebrows include one stemming from the 2007 Commonwealth Heads of Government Meeting (CHOGM), which is estimated to have cost the taxpayer in excess of Shs247b. Another was Shs95b reportedly stolen in the Global Fund scandal in 2008, Shs19b under the National ID scandal of 2010, Shs4b under the local council Bicycle Scandal of 2011, and more than Shs60b under the Microfinance Scandal, and at least 169b in the controversial compensation to businessman Hassan Basajjabalaba in 2011. Corruption scandals in the country are a common occurrence and the aforementioned are just a tip of the iceberg, and many Ugandans will, most likely, not be surprised at a new one. However, many are likely to be baffled at the extent and length of time it took for some questions to be asked of those involved. More importantly, it will be victims like, Teddy Nansubuga who was reportedly conned of more than Shs1.4b by her lawyer that will be left with more questions than answers. Ms Nansubuga owned more than 200 hectares of land in Kibaale District. She inherited the land from her deceased parents. In the course of the Bamugemereire commission hearings, it became apparent that Ms Nansubuga, who is illiterate, was taken advantage of by her lawyer, Mr Richard Buzibira, who convinced her to transfer her powers of attorney to him. In explaining to Ms Nansubuga what had happened to her, the commission’s deputy lead counsel, Mr John Bosco Suuza, perhaps summarised it best. “These thugs, these thieves, they took advantage of you – a poor lady with limited education and exposure. They lied to you and they conned you out of all those millions that I have told you. Not only that, they used your name and went to the highest office in the land and claimed to be acting on your behalf. Somewhere along the way, a minister [Ms Betty Amongi] got involved. More money was paid in your name and you know nothing about it, which is tragic,” he said. Mr Lawrence Semakula, the Accountant General, has already apologised for his office’s failure to detect and avert the theft of public resources. From his submissions before the commission, it appeared, he could only do so much given the powerful individuals involved. “It is not true that we don’t have the guidelines and laws in place. The guidelines and laws are there, but they are abused by individuals,” he said before issuing an apology. Out of the Shs1.4b Mr Buzibira and others picked on behalf of Ms Nansubuga without her knowledge, she was only paid Shs260m. The rest of the money ended in the pockets of Mr Buzibira and others. The sad tale of what befell Ms Nansubuga pales when compared to the case of “businessman” Warren Mwesigye who allegedly, fraudulently, received Shs13b from the Land Fund. The scheme reportedly starts with Mwesigye purchasing five square miles of land in 2015 from different people at Shs500m only to claim payment shortly after from the Land Fund. The alleged scheme by Mr Mwesigye is only an extension of the allegations against Mr Buzibira and his associates at Frank Katusiime and Company Advocates. It was a chain according to revelations from the Bamugemereire-led land commission. Lawyer Buzibira would allegedly trick the “illiterate” owners to grant him powers of attorney, he would then transfer ownership to Mwesigye who would then whip government bureaucracy into an unusual efficiency. In the end, at least Shs13b was released from the Land Fund to Mr Mwesigye. That, however, was not the end of the string. The actual beneficiaries of what now appears to be a fraudulent scheme were watching and waiting in Mr Mwesigye’s account for their share, at least by Mr Mwesigye’s confession. He told the commission that money went directly to his creditors including Legacy Group owned by businessman Ben Kavuya. Mr Mwesigye did not name the other beneficiaries. But Kavuya in an Interview with Saturday Monitor dismissed Mr Mwesigye’s claims. “I absolutely disassociate myself from that fellow. We’re a legitimate business company and he has never even tried to borrow from us. What he did is very bad and he did it under oath,” Mr Kavuya said. He had also in an earlier interview with this newspaper asserted that his company had no records of ever lending to Mr Mwesigye. Commission’s lead counsel Ebert Byenkya told Saturday Monitor, in an interview, that it was becoming clear each day that the people who benefitted were not entitled. He, however, explained that they would summon more people in the coming days over the fraudulent scheme. 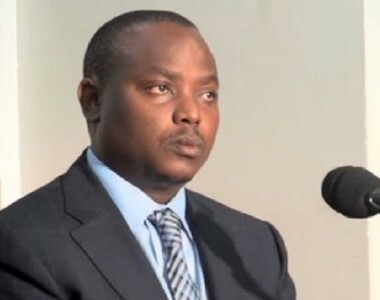 Richard Buzibira, an associate at Frank Tumusiime and Company Advocates, is accused by the Commission of Inquiry into Land Matters of being the face of a scheme that fraudulently acquired more than Shs16 billion meant to compensate 20 claimants from the Land Fund since 2013. Mr Buzibira and others, it is alleged, fraudulently acquired letters of attorney from their clients and working with senior government officials processed and received billions of shillings. He stands accused of conspiracy and involvement in the questionable dealings, failure to act professionally, and other criminal acts. “We began receiving instructions for Land Fund in 2013 and I acted as an agent and advocate. The clients came on referral basing on the number of cases I had handled. The money was paid quarterly in instalments and the vouchers show that Shs13.3 billion has since been paid and balances in the range of Shs5 billion is still pending,” Mr Buzibira testified. Pr Daniel Walugembe, who doubles as a land dealer, is accused of defrauding government of more than Shs2.5b. He was arrested and detained after being quizzed by the commission. Pr Walugembe of Internal Gospel Church in Kampala was dragged to the land commission by Elisabeth Musoke, a clinical psychologist, for allegedly selling land belonging to her family to the Uganda Land Commission (ULC) without consent. The land in dispute measures approximately 507 acres. Pr Walugembe denies the fraud charges. He says he paid Shs500m for the land he later sold to government at the amount. The former Kibaale District staff surveyor acquired more than 1,000 acres at Shs72,000 nominal fees and later sold the same land to ULC in 2014 at more than Shs1b. He sold another portion of land to Hoima Sugar Ltd at Shs390m. He is also accused of aiding several government officials and other powerful individuals to acquire substantial pieces of land later sold to government through the scheme. His role, it is alleged, was to check the accuracy of the survey files and also ensure the title was followed. He denied that he procured proprietorship of land occupied by other people to dupe government and acquire payment of Shs1b but admitted receiving the money and sharing it with other people whom he preferred revealing to the commission in a closed-door session. Mr Musinguzi, is currently a senior land management officer for Hoima District. He was arrested and released after recording a statement with the police. The Executive Director of National Information Technology Authority-Uganda (NITA-U), is accused of selling a 640-acre piece of land at Bugangaizi, Kibaale District, at Shs928m obtained from the Land Fund. Part of his land is reportedly worthless. Mr James Sakka has since got a payment of Shs402m. Mr Sakka was also faulted for selling land which did not qualify under the Land Fund, did not execute a sale agreement with ULC and did not qualify to be an absentee landlord as required by law. The “worthless” land was valued at Shs480m while 70 per cent of the land that was occupied by squatters was valued at Shs448m. In his testimony, Mr Sakka admitted receiving Shs402m in instalments out of total Shs927m. His land was valued at Shs15.2m. Robert Mwesigwa Rukaari is accused of receiving Shs4.1b from the Land Fund in 2016 and 2017 for land on Plot 1 Block 123, Plot 2 Block 269 in Buyanda and Plot 3 Block 62 in Bugangaizi yet he neither owned land nor was an absentee landlord in the area. “I first received Shs455m in 2016 and then in January 2017, I received Shs100m and in June I received Shs3.6b,” he told the commission. He was accused of using his influence as chairman of NRM National Entrepreneur’s League and his American Procurement Company to receive the payments from government. 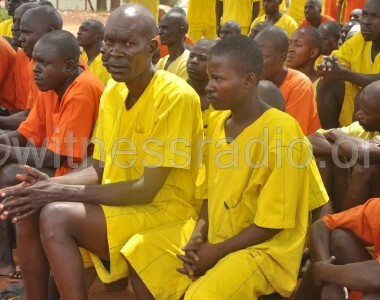 Mwesigwa and Pr Walugembe used J.L. Oulanyah & Co Advocates owned by Deputy Speaker Jacob Oulanyah to receive at least Shs8.6b from the Fund. Rogers Kweezi is the principal human resource officer of Kibaale District. He is accused of, among other things, corruption, connivance, conflict of interest and abuse of office in regard to acquisition of the land. He was quizzed by the commission and later arrested for his role in regards to various plots of land he acquired and sold to ULC at Shs3.7b upon investing only Shs210,000. He disputed valuation reports but admitted receiving more than 50 per cent of the total sale price and that part of the money was paid to his wife Carolyn Kisembo, who applied for one of the portions of land. The Ministry of Gender Permanent Secretary, Mr Pius Bigirimana is accused of having received under unclear circumstances compensation for land in Zirobwe from the Fund yet he did not qualify for compensation. He reportedly demanded for Shs504m from the Fund in 2016 for 50.5 acres of land on Plot 5 Bulemeezi Block 103 that had been encroached on by squatters. In line with the request, Lands minister Betty Amongi wrote to the commission in 2016 authorising the initial payment of Shs50m by the Uganda Land Commission to Mr Bigirimana. He later received Shs150m in 2017 for the same land. Mr Bigirimana pleaded that he never got to know he did not qualify for the compensation but if the commission thinks he did not qualify, he is ready to follow their recommendation. The State minister in-charge of Economic Monitoring in the Office of the President was at one time a State minister for Lands. He has been named as one of the people who acquired large tracts of an unsurveyed land belonging to the Kibaale District Land Board. It is alleged Mr Kasirivu and other district officials paid Shs70,000 nominal fees to acquire certificates of titles for thousands of acres of land in various parts of the district so as to enrich themselves. The commission termed his alleged activities as constituting “conflict of interest and abuse of office”. Lands, Housing and Urban Development minister Betty Amongi has been questioned about her role in handling of the Land Fund and failure to manage the same. She has also been cited for overstepping her mandate in making directives to pay from the Fund, some well-connected individuals. By 2013, Patrick Zikasangisa, a local businessman in Kagadi, had invested Shs15m to acquire land yet he is claiming Shs904m from the Fund. With help allegedly from his area MP and friend, Finance minister Matia Kasaija, Lands minister Amongi and ULC boss Baguma Isoke, he has received more than Shs100m from the Fund and was due to be paid more when the commission of inquiry intervened. He has been accused of fraud, speculation to get money from government and telling lies, among other things. The Principal Private Secretary to President Museveni, Ms Molly Kamukama, was questioned by the commission for allegedly directing payments from the Land Fund. She, however, said her letters were meant to address the Lands authorities on concerns raised before the President and did not in any way imply directives. The Uganda Land Commission (ULC) undersecretary was gilled for his role in the management of the Fund, including effecting payments based on “special requests” of minister Amongi. On November 23, 2016, for example, he effected payment of Shs620m to nine people on the directives of Ms Amongi. He also effected payments of Shs100m for Ms Victoria Kakoko-Sebagereka, Shs50m to Mr Kuriash Barinda of Isingiro District, and Shs675.8m to Yisaka Lwakana for land at Kooki, Katete.